An anti-Donald Trump protester holds up a sign before marching on the Las Vegas Strip on Nov. 12, 2016. In Washington, D.C., on Tuesday, about a thousand middle and high school students took to the streets to protest President-elect Donald Trump, joining a movement that has swept more than a dozen cities across the nation since his election last week. In Los Angeles, young Latinos took to the streets, chanting, “I will not live in fear,” while the immigrant-youth-led organization United We Dream declared a state of “resilience and urgency for immigrants.” Executive Director Cristina Jiménez has called on President Barack Obama to issue an immediate freeze on all deportations. There have been serious discussions going on among Latino advocacy groups on how to handle a Trump administration and what people should expect, Arturo Vargas, executive director of the National Association of Latino Elected and Appointed Officials, or NALEO, Educational Fund, told The Root. 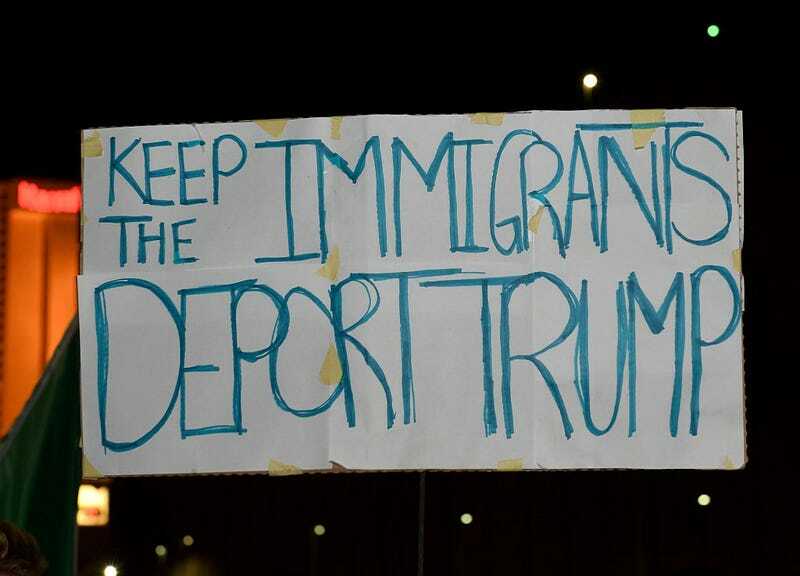 The deep concern in the Latino community stems partly from comments Trump made when announcing his candidacy, calling Mexican immigrants “rapists,” as well as his repeated promises to deport some 11 million undocumented immigrants. The president-elect has also said that he would build what he has called a “beautiful wall” around a major part of America’s southern border with Mexico, and told Mexican President Enrique Peña Nieto he expected that nation to pay for it. Nieto has said that won’t happen. But there are reports that Nieto is planning to work with Trump on his deportation plan. The nation's oldest Hispanic civil rights organization, the League of United Latin American Citizens, says that this election has left the Latino community living in fear, and that it stands ready, along with other advocates, to oppose policies that would cause irreparable harm to the community. "We have become aware of incidents where school-age kids have become targets of racial slurs such as ‘build a wall’ on school premises," LULAC spokeswoman Paloma Zuleta told The Root. "In addition, teachers who work in Latino communities don't know how to address their students' concern regarding their parents’ deportation status." The immediate worry for Latinos, though, is whether or not Trump will eliminate Obama’s Deferred Action for Childhood Arrivals program. The 2012 initiative offers temporary protection from deportation to hundreds of thousands of people who arrived in the United States as children. But it isn’t a law. It was established by a policy memo from former U.S. Homeland Security Secretary Janet Napolitano. Because the program allowed the implementation of work permits and for participants to have Social Security numbers, it could make it easier for federal immigration agents. Trump has promised to rescind it, though Obama has urged him to think “long and carefully” before doing so. United We Dream has posted a link on its website with suggestions for what undocumented youths should expect from the Trump administration and what it may do with DACA: “5 Important Things You Need to Know About DACA During a Trump Presidency.” Jiménez said in a statement that this is a time to mobilize in every city across the country. She added: "To Donald Trump and the Republican Party, we say that we are #HereToStay and we are never backing down." On his presidential-transition website, Trump says: “In several years, when we have accomplished all of our enforcement goals—and truly ended illegal immigration for good, including the construction of a great wall and the establishment of our new lawful immigration system—then and only then will we be in a position to consider the appropriate disposition of those who remain.” He goes on to reiterate his promise to build the wall, cancel “unconstitutional executive orders” and enforce all immigration laws. But over the weekend, Trump told CBS’ 60 Minutes that he is not completely averse to discussions in the Republican-controlled Congress about a fence in some areas rather than a wall. He also seemed to back down a bit on part of his immigration strategy. According to Vargas, this is the kind of position you would expect from a man who is recognizing the responsibility of leadership and is now moving to the center and to more moderate or realistic positions on issues important to the country. But Vargas has a suggestion for the president-elect, and a message.